Praise for Last Chance to Get It Right! "Tom Moore is one of the capable professionals who made me look good in the last thirty years of my forty-five year career at A.G. Edwards & Sons. He has put together a primer which should help both new and veteran investors understand financial markets and alternatives, and gain a direction and common-sense approach to their estate planning." "Tom Moore's grasp of the problems of retirement planning is superb; his methods of solving those problems unrivalled." "Tom has spelled out in plain English, just what it takes to create and implement a successful retirement plan. Boomers and non-boomers alike, will find his step-by-step road map very helpful." Between Social Security uncertainty and uneasiness in the stock market, Americans today face a more uncertain financial future than at any time in decades. Ironically, our response to this growing emergency is to spend more, save less, and put off necessary preparations until tomorrow. Are you truly prepared for the financial future facing you and your family? Let Last Chance to Get It Right! 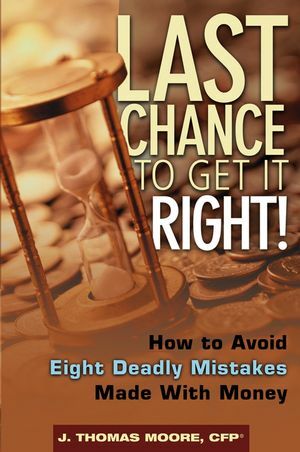 give you the knowledge and tools you need to stop making financial mistakes today-and put more money in your pocket tomorrow. J. THOMAS MOORE does consulting work with insurance companies and has worked in the investment business for more than thirty years. Until last year, he was vice president of A.G. Edwards & Sons, responsible for coordinating the firm’s training efforts in mutual funds, life insurance, and annuities. Moore was largely responsible for leading Edwards into the insurance arena. The firm’s sales in all kinds of funds, life insurance, and annuities are now over fifteen billion dollars per year. Moore continues to hold client seminars and training sessions for Edwards, spending roughly two weeks a month at various Edwards locations. In addition, Moore has contributed to a number of industry publications and has been quoted in various newspapers, including the Tennessean and the Post Dispatch. PART ONE: THE KEYS TO BUILDING WEALTH. Chapter 1: A Lifetime of Risk Management. Chapter 3: An Investment Plan You Can Live With. Chapter 5: Income Tax Risk. Chapter 6: Educational Needs of Children and Grandchildren. PART TWO: THE KEYS TO MAKING INVESTMENT DECISIONS. Chapter 7: The Risk of Outliving Your Income. Chapter 8: Best Options for Building Capital. Chapter 9: Best Options for Retirement Income. Chapter 10: How Much Retirement Income? PART THREE: THE KEYS TO KEEPING WEALTH. Chapter 11: Long-Term Care Planning. Chapter 12: Wealth Transfer Planning. Chapter 13: Getting Your Financial House In Order.